In the market for an expansive, dreamy headphone record par excellence? You couldn’t do much better right now than Ears, the latest by Bay Area composer Kaitlyn Aurelia Smith. Mining influences like the minimalism of Terry Riley, Suzanne Ciani and Laurie Spiegel, the films of Hayao Miyazaki, and the cartoons of Jean Giraud Moebius, Smith’s vision is kaleidoscopic and breathtaking, equally evoking rich earthiness and cosmic expanses. It’s an enveloping, moving record, blending woodwinds played by Rob Frye of Bitchin Bajas, bubbling arpeggios, and Smith’s vocals, multi-tracked and densely layered. AD spoke with Smith from her home, where she was prepping for her upcoming tour with Animal Collective, packing last minute provisions and gearing up for live performances. Aquarium Drunkard: I have my own personal experiences listening to Ears, but I wonder: Were you trying to evoke anything like a specific mood on this record? Kaitlyn Aurelia Smith: My intention was to create a sonic motion ride through a futuristic jungle. I wanted it to be heard straight through, from beginning to end, so that it feels like it has an intentional arc to it. Well, it’s pretty straight “up,” so it’s more a ramp than an arc. I can’t presume everyone will listen to it straight through, but that was my intention. AD: You sequenced it in a way that rewards that kind of listening. Kaitlyn Aurelia Smith: There were a few opinions when I was making it that I shouldn’t put the last song, “Existence in the Unfurling,” where I did, because in some opinions, that’s the strongest song on the album. That was definitely the one I put the most time into — that that was the climax of it. I really wanted it to be the last song, because so many albums I’m influenced by have the peak at the end; a lot of classical albums are like that and I just wanted it to feel like an entire piece of work that’s all tied together. AD: You composed a lot of this record on a Buchla. How did you find your way to that piece of equipment? Kaitlyn Aurelia Smith: Especially the one that I had, which is a 100 series, which is one of the very first ever made. Now, I play on the Buchla Music Easel, which is a remake of one from the ’60s, [when] there were only 15 or 20 of those made. They’re all different from each other. AD: What about the instrument speaks to you? Is it a tonal thing? A feel thing? Kaitlyn Aurelia Smith: The interface is very intuitive, because Don Buchla had put so much emphasis in creating interfaces that were performative and brought novelty to the composer. He wanted to create an interface that wasn’t like a keyboard, that would seduce your brain into using different faculties than you’re used to. AD: Before you started utilizing the instrument, you’d studied guitar and voice, right? AD: How do you classify what you do now? There’s obviously a modern classical element. You can hear echoes of new age and ambient, too, certainly elements of jazz. Do you feel like your music comfortably fits into those designations, or is that something that doesn’t necessarily concern you? Kaitlyn Aurelia Smith: I don’t really think about it that much, until someone asks me. [Laughs] My dad asks me that all the time: “What genre can I say you’re part of when my friends ask?” I never really know how to answer it. I relate to the neoclassical movement, people like Nico Muhly and Max Richter — I’m inspired by them and would hope to be part of that community. But I’m also very inspired by the electronic music community, and the community of people like Animal Collective, Dan Deacon, Panda Bear — I don’t really know what that genre is. AD: Do you feel like there’s an emotional or spiritual component to what you do? Kaitlyn Aurelia Smith: It definitely feels that way for myself. I try and keep my own personal experience separate — I try not to make that public. No matter what, it’s always about someone else’s experience, and I feel like describing my own would get in the way. But it’s definitely the place in my life where I exercise that practice of awe for nature and existence. All that, the universe. 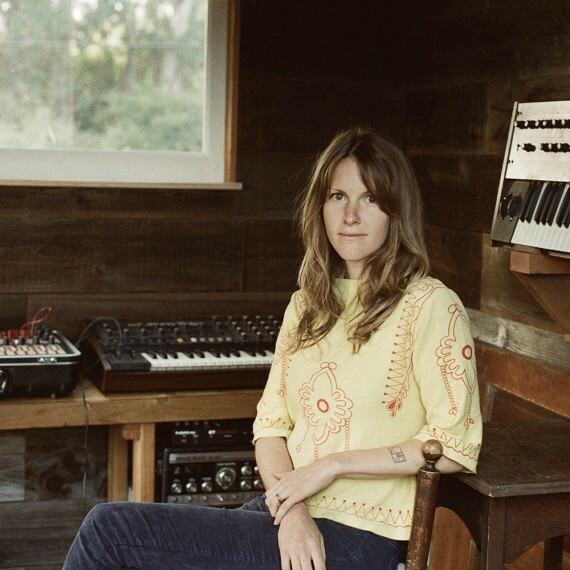 Kaitlyn Aurelia Smith: It’s hard to say. That term is so subjective. It means something different to every person. The music is a very active mental space for me, so to some people “meditative” implies a calm, still place with not many thoughts. I can’t say that that happens. It happens when I’m performing — which is why I’m in love with performing — but when I’m writing, it’s the opposite. It’s hard for me to totally identify with that word, but it’s definitely where I find my flow state. AD: There’s a lot of contrast between the “natural” sounds — the breath of the reeds and your vocals — playing against the electronic elements on Ears. Was that an intentional compositional decision? Kaitlyn Aurelia Smith: I wanted it to be a little bit confusing what was a synthesized instrument and what was an acoustic instrument. I wanted to create an environment where people aren’t using the logical part of their brain to figure out what’s going on. AD: A song like “Envelope” really succeeds in that. Kaitlyn Aurelia Smith: I play mbira, which is an African instrument. It has these metal pieces — most of the time they’re bottle caps — and the purpose of it is to create this rattle sound which turns off the logical side of your brain, so that you just listen. That’s been something that’s really influenced me. I tried to do that a lot with the pulsing and the stereo filtering, to create something that’s irregular, so your brain isn’t trying to find predictable things. AD: Nature is a primary influence in your work. Do you have specific rituals you have related to nature when you’re writing? Kaitlyn Aurelia Smith: Just a lot of hiking and alone time, to just listen to my environment. That’s usually where I get my inspiration, being quiet and listening to what my subconscious wants to make. I do listen to music, and make very intentional playlists of grooves and timbres I want. I create a kind of treatment, which I’ve learned from my husband [director Sean Hellfritsch]. He’s a filmmaker and I see him creating treatments all the time, and I think it’s such a powerful tool. But the main thing I do before I create is be quiet in nature and hear what my internal ear wants to make. AD: When you do that, are you imagining melodies? Musical ideas? Or just listening? Cool stuff. I want more of this.